I’ll be honest, it hadn’t been my first choice to spend a special anniversary, here on this isolated island in the Mediterranean. We arrived late on a humid evening and awoke to a stunning view from our balcony; the fortress city of Valletta before us. The morning sun played on the water and radiated off the honeyed hues of limestone that dress the city. I was instantly captivated. 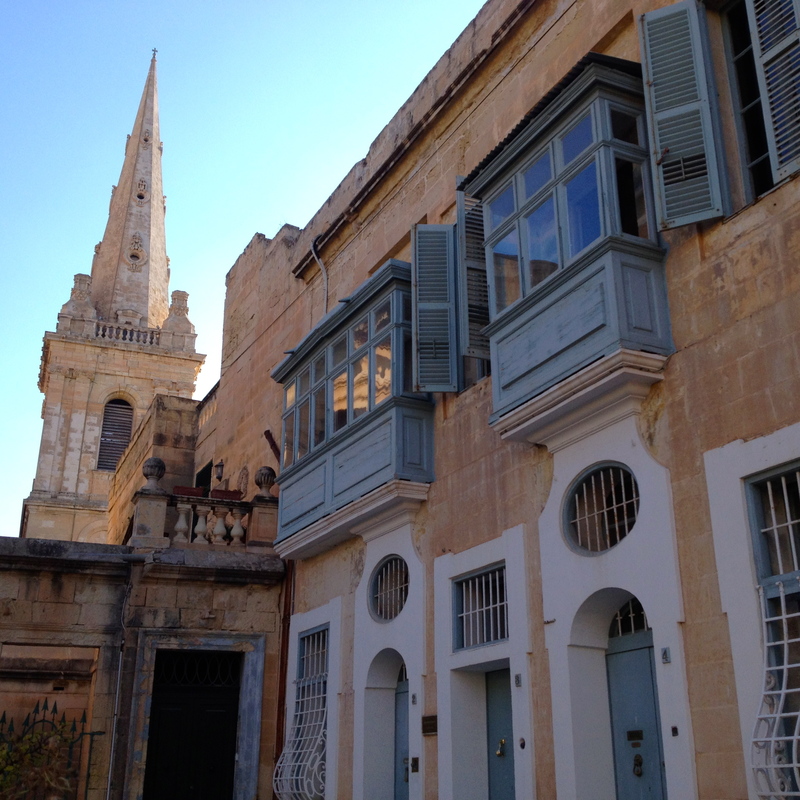 Valletta, a city of bells, bastions, harbours and limestone, has a story to tell. 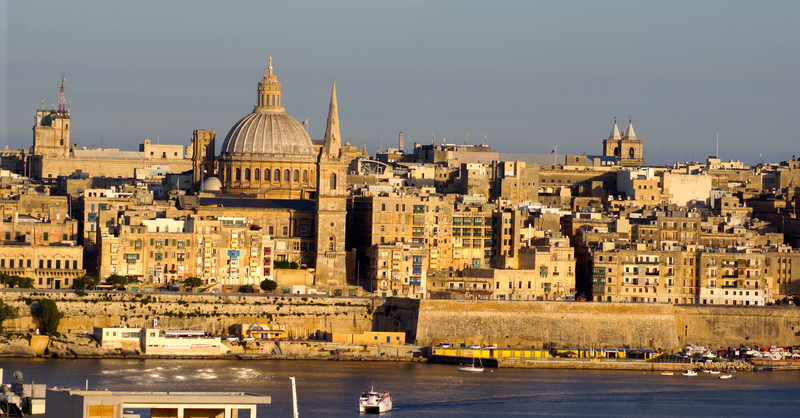 Valletta is the heart of this tiny island nation and the most southerly capital city in Europe. 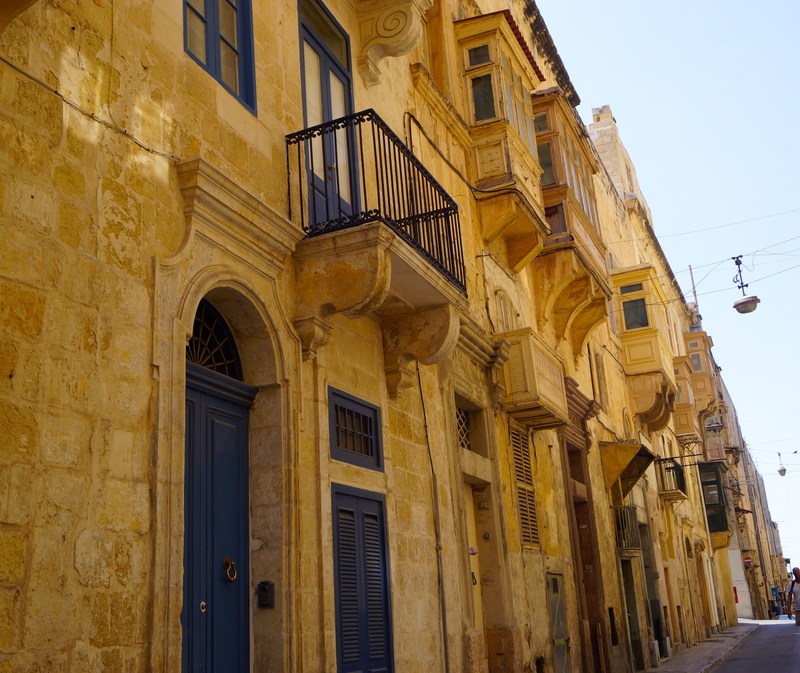 A four hour sail from Sicily, Malta is a country rich in architecture and long in history. My husband promised I’d fall in love with it. He was right, and without a doubt, I now consider Valletta the equal of many other European cities. That splendid view offered more church domes than I’ve seen in any one vista. Bells chimed constantly from nearby steeples, at times melodious and dissonant. 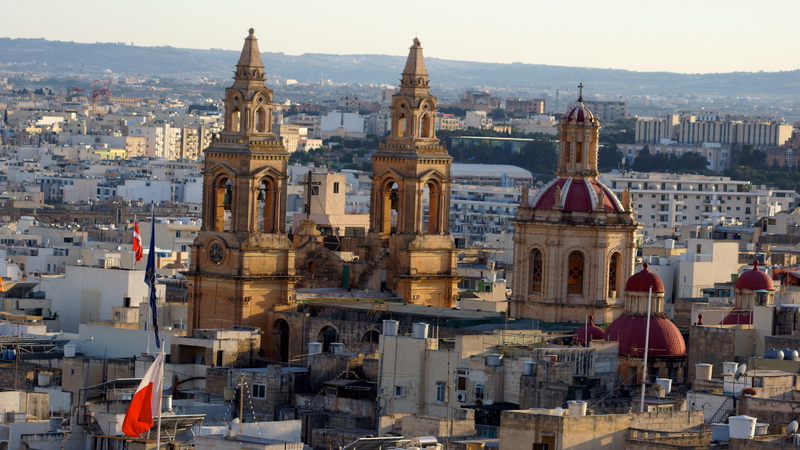 Although the Maltese language is an ancient fusion of Arabic and Romantic languages, the country is staunchly and passionately Catholic. 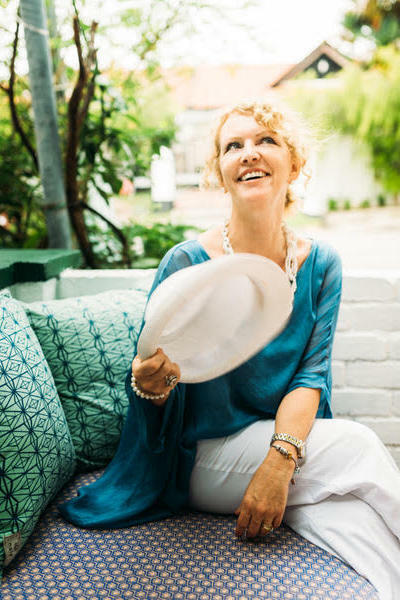 Their faith plays a part in everyday life with churches at the center of each parish; 360 of them serving a population of little more than 400,000…quite astonishing. And then there’s the question of size. The Maltese islands (Malta, Gozo & Comino) are a mere 316 square km. but they have assumed a significance far exceeding that meagre landmass. Coveted as a strategic port and defensive position, the islands were given by the Pope in the 16th Century to the Knights of St. John who had lost the island of Rhodes to Ottoman invaders. Also known as the ‘Knights Hospitallers’, the Knights of St John followed their religious calling to care for the sick and shelter the poor, their origins dating back to the early Christian pilgrimages. They controlled the islands from 1530 to 1798 and in that time constructed massive fortifications, lavish churches and cathedrals, and beautiful urban architecture. I find it somewhat intriguing that The Knights were chosen from noble and wealthy families, taking vows of chastity, obedience and poverty, often giving their own property to the order. Though originally not allowed to shed blood, a new class of warrior knight was formed to circumvent this. Thus, the Knights not only preached and healed, but they were also formidable soldiers. Valletta is a baroque city of piazzas, palaces, churches and gardens, said to be a city built ‘by gentlemen, for gentlemen’…those accomplished Knights. In 1566, Jean Parisot de Valette, directed his Knights to fortify the Christian stronghold against Ottomans invaders. The Knights and Maltese became legendary after successfully repelling the Turks in the Great Siege. Funds flowed in from European rulers to further transform this city. De Valette’s imposing bastion walls still enclose this UNESCO World Heritage Site. 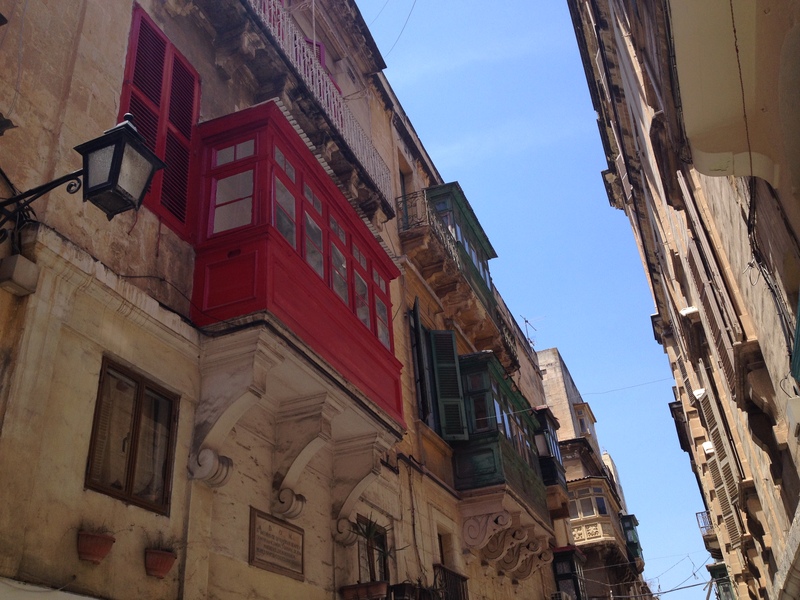 It may seem curious, but in Malta one drives on the left hand side of the road and passes by red British post boxes. 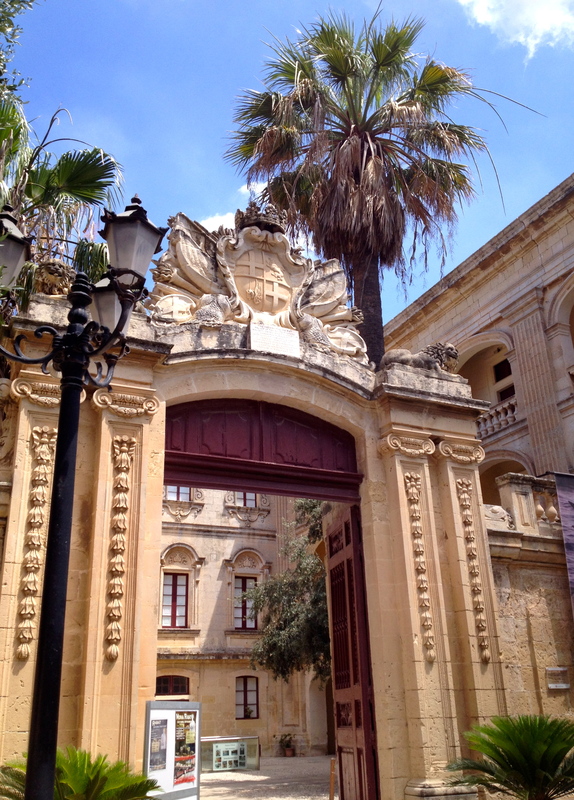 These British remnants are reminders of when that nation was invited to assume control of Malta. After a fleeting occupation by the French, the British were offered control of the Island in 1800. 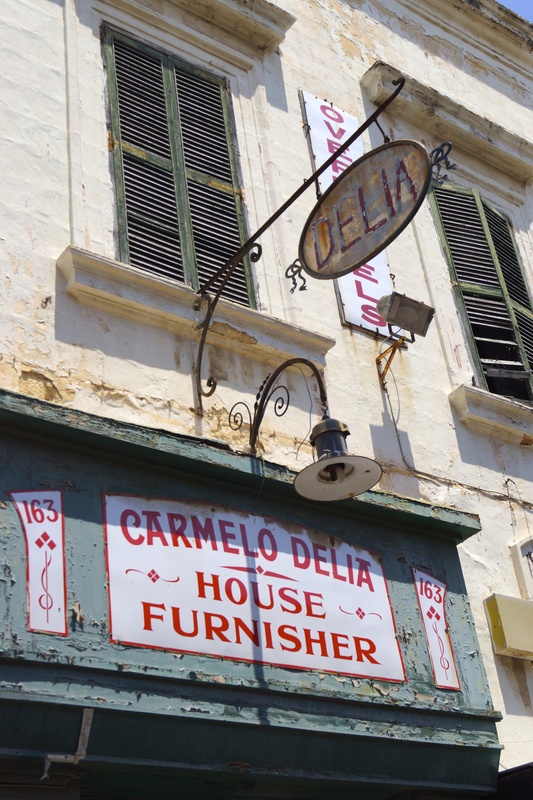 Other vestiges of their presence endure in statutes, architectural embellishments, English as a second official language and most charmingly, the abundance of archaic signs. Those ‘old fashioned’ ones that I love so well. It’s all enchanting, yet somehow down to earth in its faded elegance. Local limestone was the predominant building material in Malta. 16th Century Churches, villas and auberges, the once stately dwellings of the Knights, are all chiseled from this malleable stone. I marvelled too at the tall, four storied apartments. 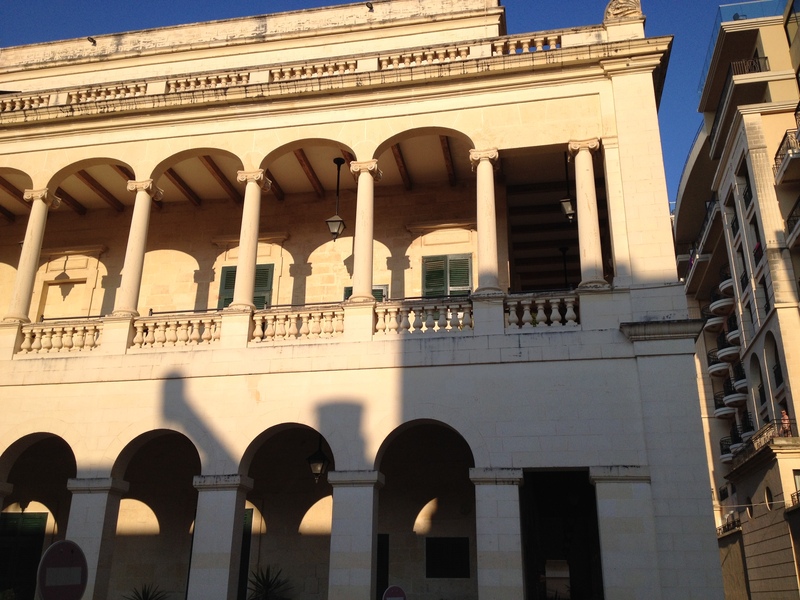 They are narrow and deep, made distinctive by the Maltese version of the Italian logia, the gallarija. Even today they afford residents an ornate perch from which to peer down onto the narrow cobbled streets. I watched neighbours chatting through the narrow side windows, though many gallarija seemed to double as laundry rooms, the rare breeze on tiny lines of clothes. Wonderfully, many of these wooden enclosures are brightly painted. Those untouched and neglected are also interesting; layers of peeling paint hinting at their former glory. 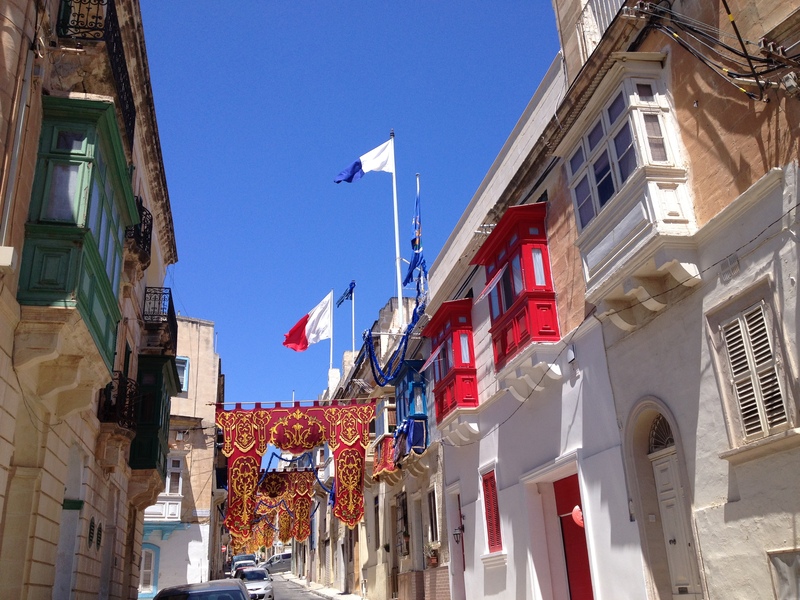 When wandering the streets of a Maltese town, your eyes are drawn instinctively upwards. But you’ll be distracted and delighted too by the archaic signs that still announce stores and services, many of which have long ceased trading. 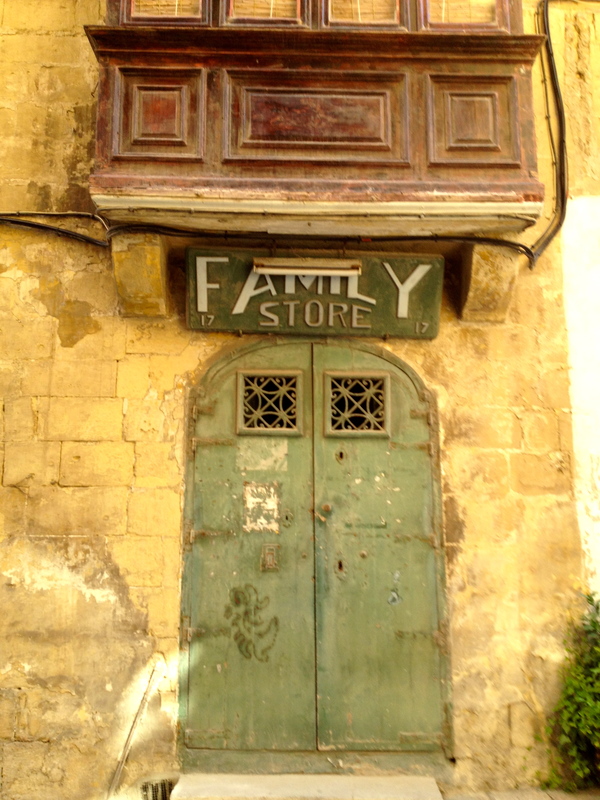 Even boarded-up shops recall close knit communities and family ventures. One can easily envision the scene. People stroll from shop to shop as carriages rattle by. Horses slumber in ground-level stalls of the tall homes; reminders still in the large wooden doors that now house vehicles. Valletta’s hilly streets must have been burdensome for beasts and humans alike as they strained to haul goods to merchants from the wharves below. Evocative street names reveal a vibrant past such as Old Bakery Street, Merchant Street and Old Theatre Street. These narrow side streets are much quieter these days, most tourists preferring the chance to promenade on bustling Republic Street. We came upon a small square with beautifully refurbished apartments and, through a chance encounter, were graciously allowed to peek inside a law office. Our host, Hugh, unbolted the heavy wooden doors that separated his powder blue gallarija from the interior of the offices. We gazed out to the nearby steeple and to the busy harbour opposite. 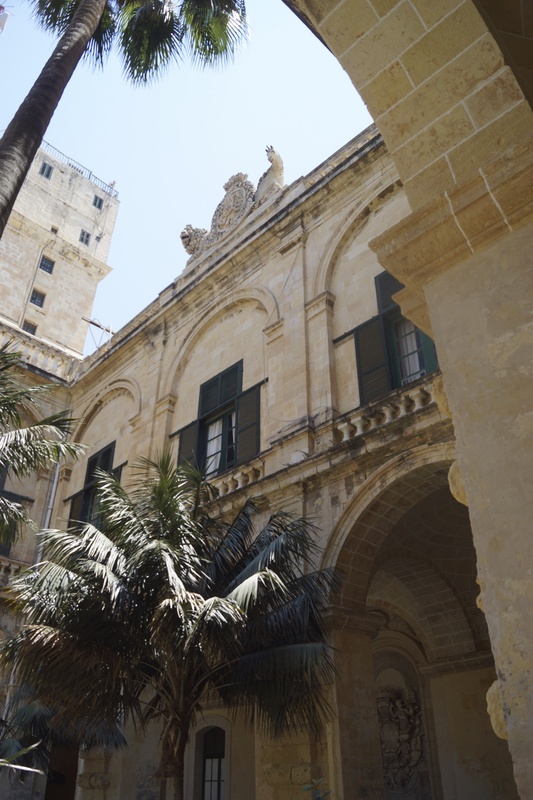 I admired the beautiful centuries-old Maltese tiling at my feet and the frescoes adorning the high ceilings, imagining many such treasures hidden inside the buildings of Valletta. 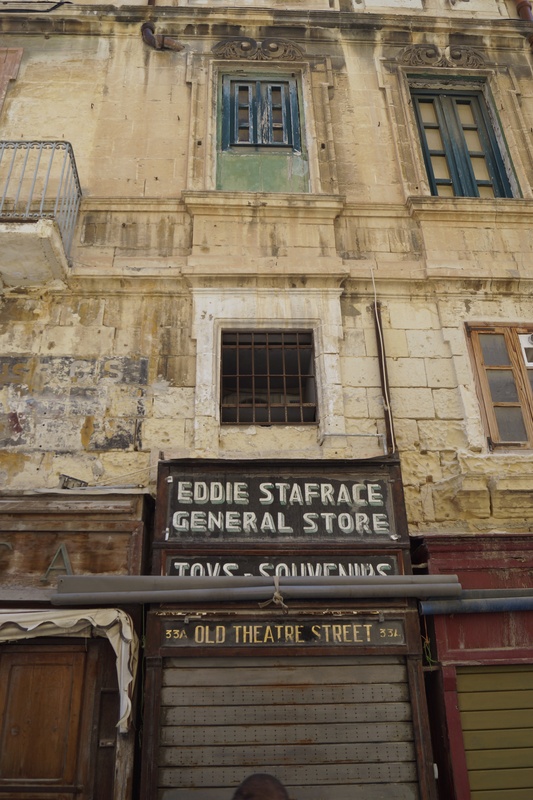 Hugh assured us that many of these once-grand buildings are being restored, perhaps prompted by the declaration that Valletta will be Europe’s Capital of Culture for 2018. If you live in an archipelago, boats are a daily part of life. 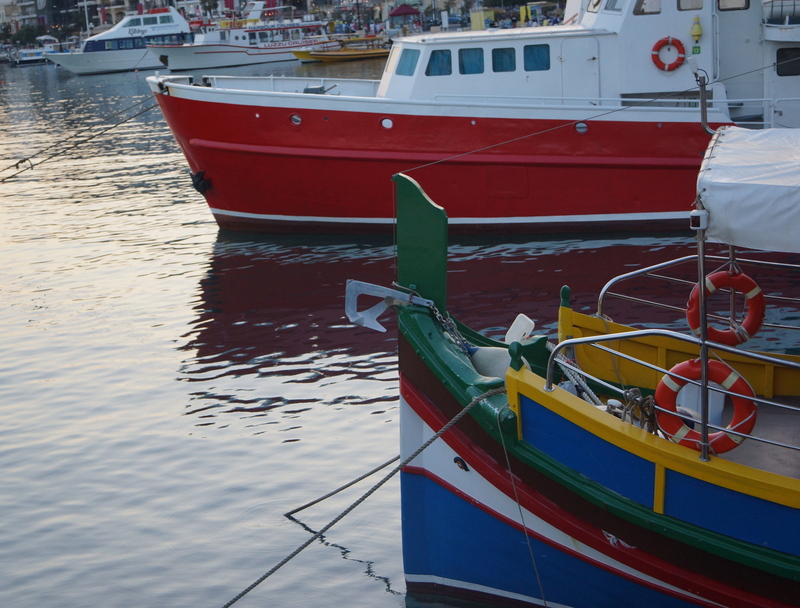 Ferries, harbour craft, sailboats, cruise ships and traditional Maltese boats are in constant motion. The luzzu is a traditional fishing boat with the ‘eye of Osiris’ painted on each prow, Phoenician style to ward off evil and bring good luck. They bob prettily in the harbours and troll the blue seas for lampuki, the national fish. 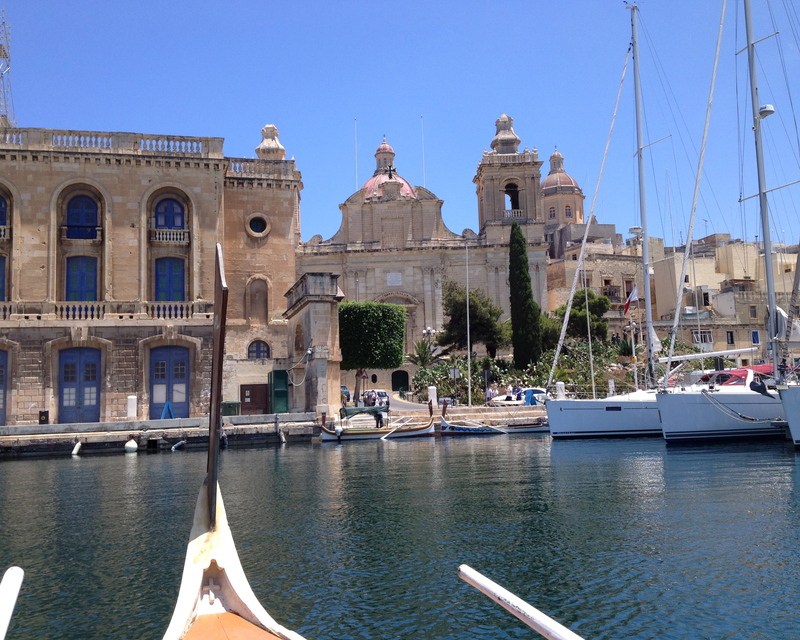 We hitched a ride on a venetian style dghajsa in the Grand Harbour. Disappointingly our Sicilian ferryman fired up his outboard, waving off our romantic notion of rowing across. Enrico delighted in telling us that a celebrity couple had sat in his small boat just a few days earlier. 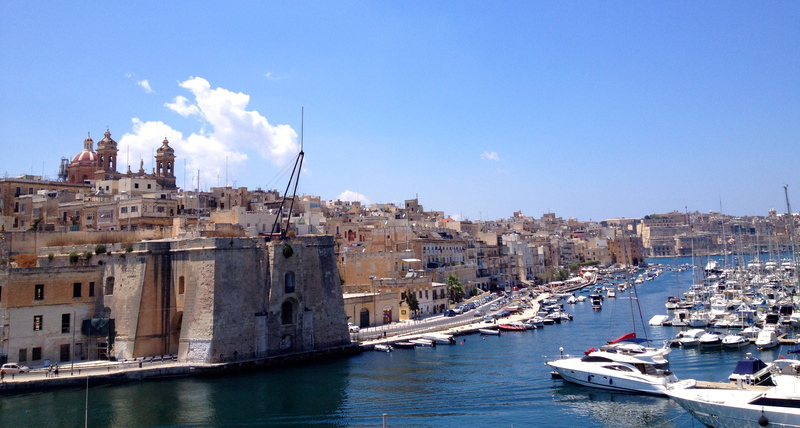 He pointed out their massive yacht, still anchored against the imposing backdrop of the St. Angelo bastion. There’s yet another movie being filmed in Malta; previous ones include Monte Cristo, Gladiator, and Popeye. In fact, the next afternoon we were caught up in a car chase scene, turning to see machine-gun toting renegades coming our way. We were hastily ushered off ‘set’ and reluctantly meandered away from the action. No ‘star’ sightings I’m afraid and to be truthful, filming in the 35 degree heat looked long and tedious. We crossed the waters daily from Sliema. At the foot of the massive fortifications were ranks of warehouses, resplendent in vividly painted doors and windows. They say this tradition of colour coding was for illiterate sailors, making it easier for them to identify the correct store house. Malta straddles the east-west Mediterranean seaway, plied for centuries by one civilization after another. Time and again its strategic importance has been proven. One evening with a brilliant full moon overhead, we cruised the harbour of Valletta and the neighbouring Three Cities. 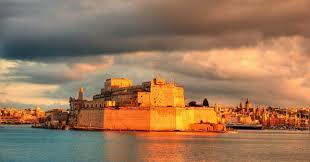 One of them is Birgu, where the Knights built their second capital, the precursor to Valletta. The three towns were enclosed around 17th century ramparts along with Fort Angelo. We heard tales of battles and heroes, and of a daring escape by the famed and volatile painter, Caravaggio. Despite not being of noble birth nor of good character, the Italian Caravaggio was nonetheless admitted to the Knights of St. John in 1608. Not long after, the talented painter tangled with a high ranking knight in a brawl who was seriously wounded. Caravaggio was hasitly imprisoned in Fort St. Angelo. Thankfully his beautiful paintings already graced the Palace of the Grand Master and St. John’s Co-Cathedral. The supposedly formidable walls of one of Malta’s strongest forts were soon the scene of Caravaggio’s daring escape. He was bundled off in a boat back to Italy; it occurs to me that this would indeed be a story line for a thrilling Maltese movie! From that first sitting on our balcony at The Palace Hotel, I continued to count bells. There seemed to be a melodic ‘ting’ to announce the quarter of the hours…then a tinny ‘tong’ to announce the hour. Yet, just when I thought I had detected a pattern, the bells would cut short or ring incessantly, my theory left in tatters. But it’s festa this time of year, which plays an integral part of Maltese culture and perhaps the bells are more relentless than usual. Every summer each parish celebrates festa, a religious festival, and preparations in ‘our’ neighbourhood were underway. 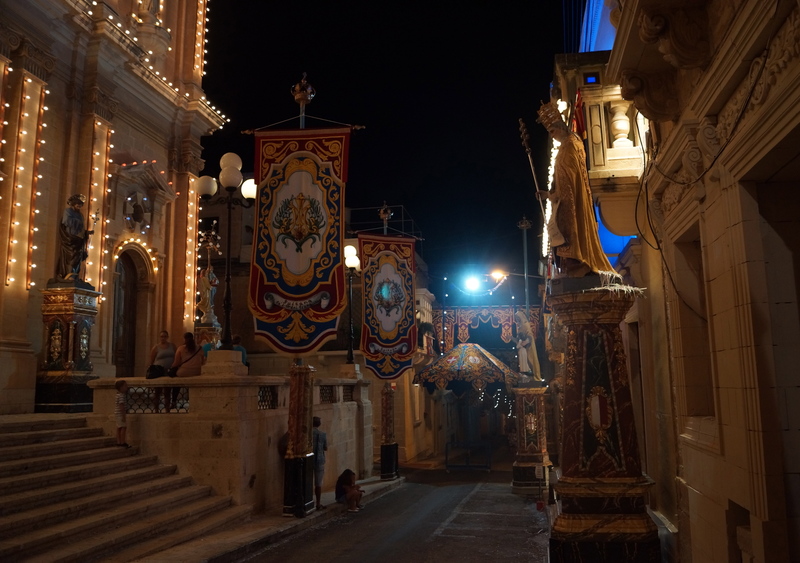 Lavish banners were hung the width of the narrow streets. Lights were strung and churches outlined and decorated with an impressive, though somewhat gaudy array of lights. Life size statues of saints positioned on pedestals oversaw the festivities. Fireworks displays coloured the night skies, each parish vying to out-dazzle the other. We followed a marching band on our return one evening, tell tale signs of the upcoming festa. Copious amounts of confetti already littered the lively streets. Just one solitary sweeper was tasked with the clean-up as the rest of the parish strolled behind the marching band, sing-song meeting the rhythm of drums and horns. Music is vital to festa. 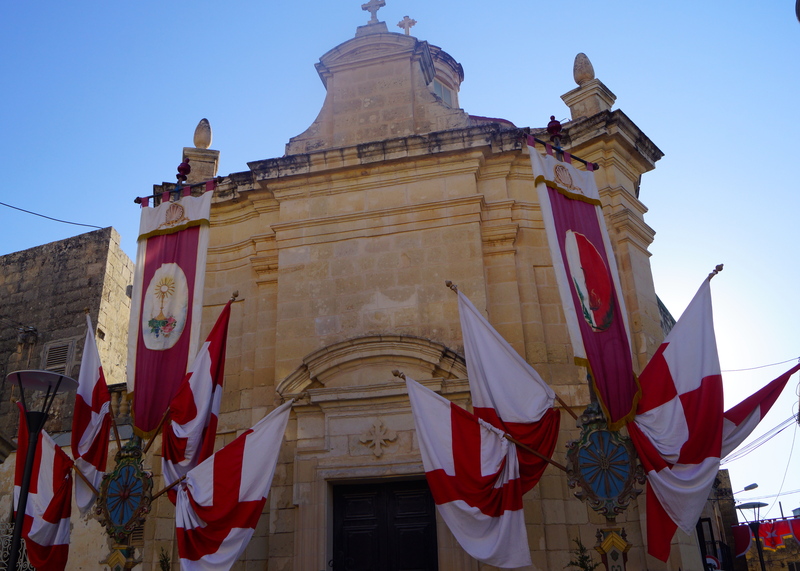 We sought a more quiet side of Malta the next day and hopped on a local bus to Mdina. 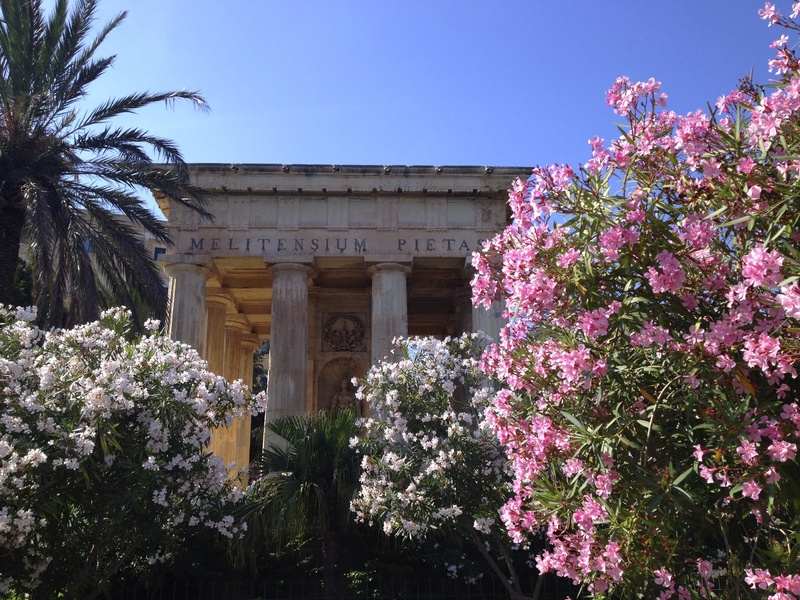 Settled by the Romans, who had built on even more ancient settlements, Mdina was the island’s capital until 1530. Positioned on the edge of a plateau with verdant vineyards below, the fortified walls are entered through imposing stone gates. Once inside,a mix of baroque and Norman architecture grace the narrow streets in Palazzi or grand old houses and religious buildings. Tall walls shelter Benedictine nuns in convents; they commit for life. There are beautiful Cathedrals and Chapels, now restored to their original brilliance after Napoleon’s troops looted them in 1798. When the soldiers returned for more, the local folk rebelled and eventually put an end to France’s short rule. These days the Maltese aristocracy mostly live here and with fewer than five hundred residents, its tranquility is part of its allure. We wandered, then treated ourselves to a horse and carriage ride which trotted us through the only complete medieval gate in Malta, the Greek’s Gate. 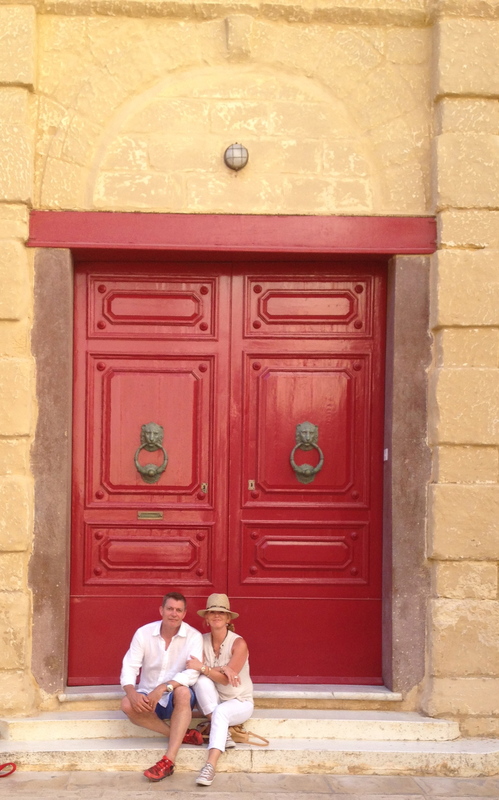 We ventured across a main road to Rabat, a suburb of Mdina. Saint Agatha is their patron saint, a statue of her resting in the church and is paraded through the streets during festa. This village was also in full preparation for the upcoming festival; banners, bunting and flags coloured the townscape. We soaked up the atmosphere, foregoing the Roman and Byzantine attraction of catacombs and tombs; uneasy that these labyrinths as well as bomb shelters lay beneath our feet. Bombs rained down on the Island for 142 days and nights during the second World War. As the most bombed place in Europe, the entire population would go underground into a warren of shelters. King George the Sixth awarded Malta the George Cross for ‘their heroism, bravery and devotion.’ We encountered memorials and plaques that remind the Maltese of this still today; they are justifiably proud people. 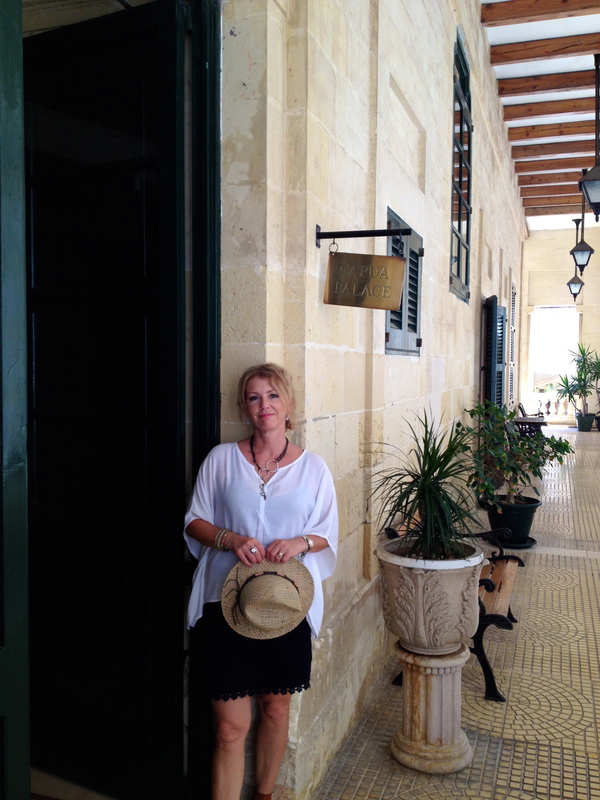 We preferred staying above ground and found ourselves back in Mdina on the bastion top patio at Fontanella’s. With the view rolling out to the sea beyond the vineyards, we indulged in our favourite local ftjira and chilled Maltese wine for a long lunch. The languor of a hot July day and the perfect view kept us rooted to this idyllic spot. It seemed church bells had followed us from the city. The so-called ‘silent city’ was very much alive that afternoon. 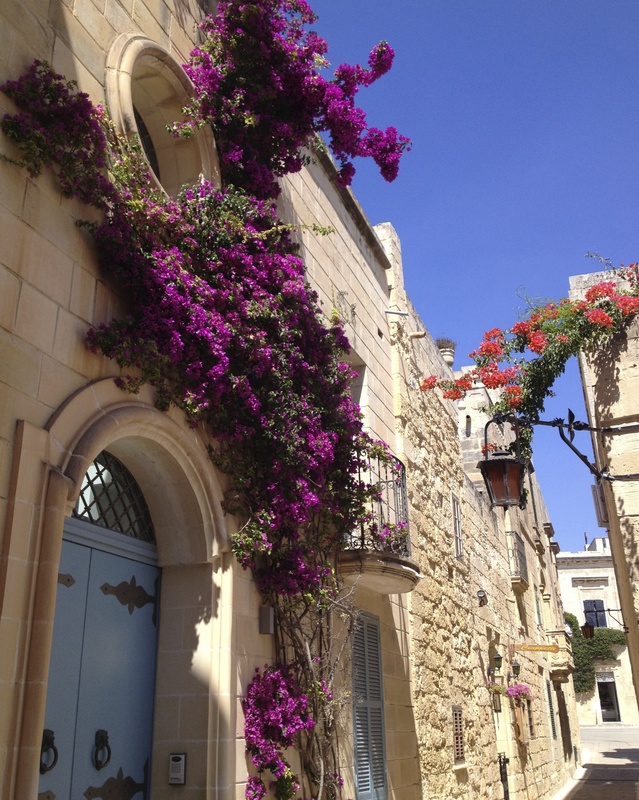 If Valletta is the beating heart of Malta, then surely Mdina embodies the soul of this land. Somehow it seemed fitting, by good fortune rather than design, we found ourselves in a suite in the Palazzo Cupua, a treasured annex of the Palace Hotel. Perhaps it was a nod to our anniversary from Thomas, our obliging concierge whom we came to know. As I had taken such interest in the architecture on this trip, it was a thrill to see the grandeur of these once stately homes and actually stay in one. Carved limestone staircases led to polished marble hallways, delicate painted frescoes graced the ceilings and once again intricate patterned tiles covered the floor. Perhaps it isn’t surprising that my only souvenir of the trip was a small print that depicts tiles in a lavish villa; it seemed perfect. Tall shuttered windows looked out to the colonnaded verandah, of course, it was all sublime. This Palazzo was referred to by Thomas MacGill’s in his book, Handbook for Strangers. He visited Malta in 1839. We concurred, though the real pleasure was that it spoke to us of a time long past when it stood mostly solitary on a hill overlooking the same timeless view that beguiles travellers still today. We flew away from the tiny island in the morning sun; over the ramparts, the cathedrals and smooth limestone. 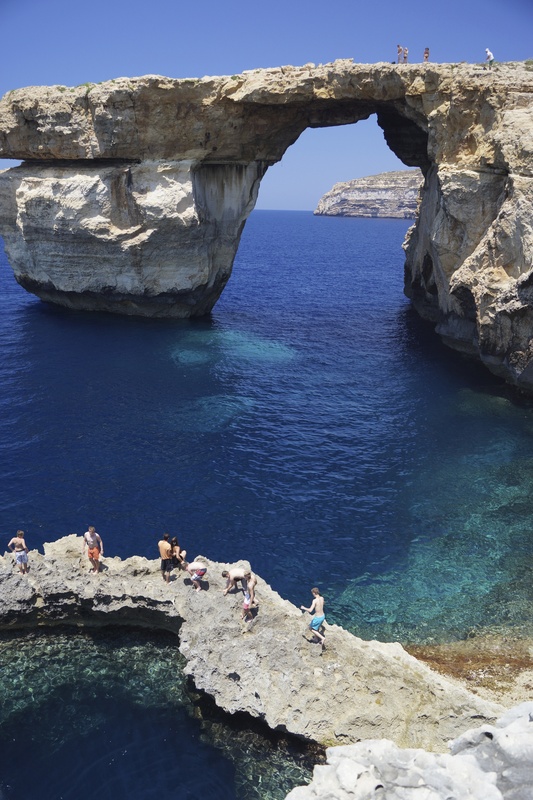 On top of the waters that we had sailed on and snorkelled in, the impossibly blue Blue Lagoon calling back to us, along with the cobalt blue waters of the Azure Window. The Hypogeum also beckoned, those Neolithic temples and carvings older than the pyramids themselves. Sadly, we hadn’t found time to visit. It seems we’ll just have to return to this fascinating treasure in the Mediterranean. Not to mention, there’s still the puzzle of the bells to solve!